Railpictures.ca - sdfourty Photo: Sharp staccato stack talk wakes the Saturday morning Sunnyside Ontario neighbourhood as the westbound expressway parade paces MLW built CNR Mountain type 6060 on August 23, 1980. The Upper Canada Railway Society car 13 Cape Race holds the markers on this train. At extreme left note the single level 100 series GO control cab car leading the approaching GO train on track 1 CN Oakville Sub. Perhaps viewers with detail knowledge of this train will be willing to share. Kodak Tri X pan b & w ASA 400 negative. Photographer S. Danko. | Railpictures.ca – Canadian Railway Photography – photographie ferroviaire Canadienne. Caption: Sharp staccato stack talk wakes the Saturday morning Sunnyside Ontario neighbourhood as the westbound expressway parade paces MLW built CNR Mountain type 6060 on August 23, 1980. The Upper Canada Railway Society car 13 Cape Race holds the markers on this train. At extreme left note the single level 100 series GO control cab car leading the approaching GO train on track 1 CN Oakville Sub. Perhaps viewers with detail knowledge of this train will be willing to share. Kodak Tri X pan b & w ASA 400 negative. Photographer S. Danko. Nice shot! But you asked for comments! I suspect the date’s wrong. The UCRS Newsletters for Aug and Sept 1980 refer to the UCRS trip to Niagara Falls on Saturday, 19 July 1980, as “Toronto’s Last Public Steam Train”. Then for the NRHS Convention, 6060 ran to the Falls again on Thurs, 24 July 1980, and to Washago via Bala and Newmarket Subs on Sat., 26 July 1980. That ended its excursion duty in the east. On Sat., 2 Aug 1980, 6060 left MacMillan Yard on CN freight #375 for Edmonton, and has been in the west ever since. 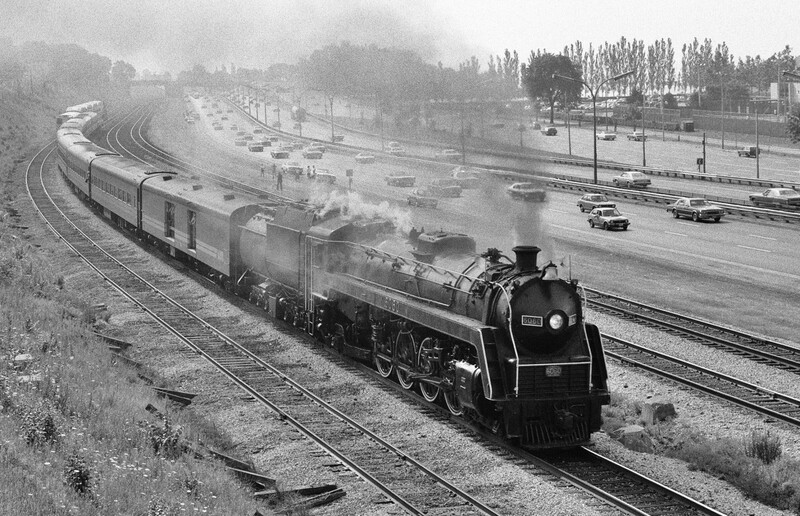 Because “Cape Race” is on the train in this shot, I’m thinking the photo was taken on 19 July 1980.